Thank you to our invited guests for your valuable feedback and comments! we wanted to cast a grid in concrete, since we did not manage to succeed in assignment 04. after the things we have learned by failing, we tried it in a bigger scale. first tristan donated one of his t-shirts, which seemed to have a good stretchy fabric. then we sewed the pattern where we wanted to have the holes. a self-built funnel helped to insert the concrete. we wanted to put up the fabric on a construction that the mass could flow down into the form by gravity. 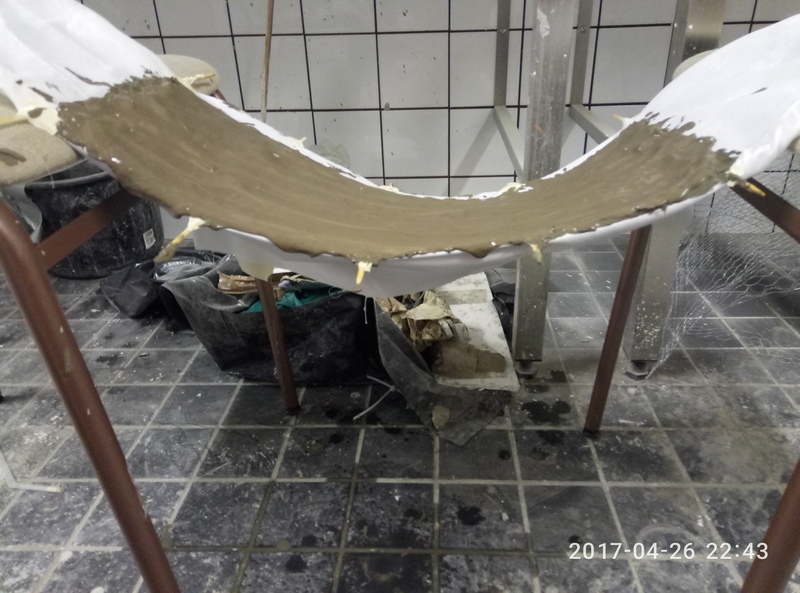 after the casting we already saw some weak spots where we thought it will break, but the concrete is so hard that it still is one piece. we have learned a lot by doing it again and by approaching us to the result we wanted to have. if we would do it again, we would probably change the shape a little bit, since aesthetically speaking we could still improve it. furthermore we would also sew the upper part, which we did not to be able to insert the funnel, but it would have worked with just one opening, too. in addition, we also wanted to do another grid, where we tried if it might also work with thinner concrete. the casting method was quite ‘normal’, we made a mould out of cardboard. but we expected it to break, because we thought it will be too thin. therefore we were surprised when we demoulded it, because it turned out well and it was very solid. 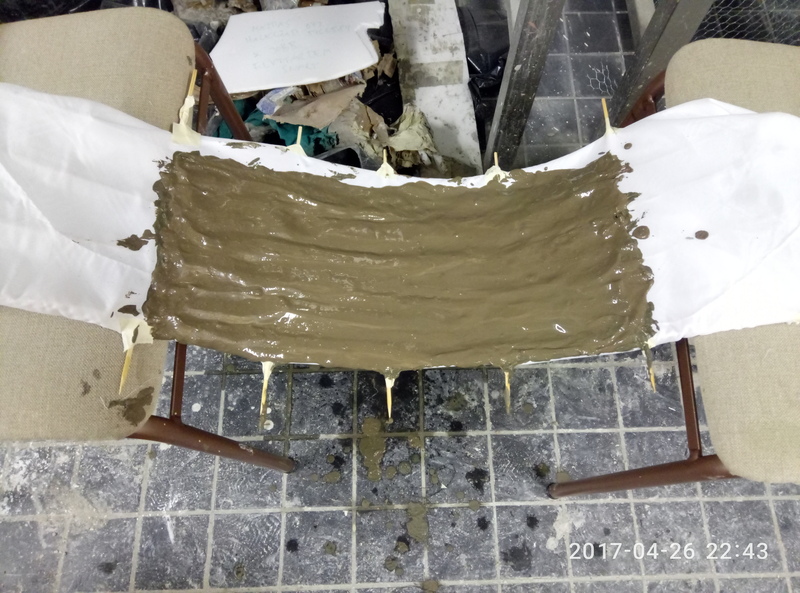 I decided to make a paper model to cast in sand using the adaptive formwork technique. I chose to use the digital site information from my studio project and make it in scale 1:500. The final model would then be approximately 70*50 cm. I used a type of 300 gram paper​ to cut each height level and the same type of paper for the 2mm height difference for every curve. The model was then assembled using tape. For casting with every level in the correct height I cut out several mirrored sections from the site to support the paper model from the bottom of the bounding box. The thought was that I would use these sections to level the sand underneath the model to get everything in the right height. This didn’t turn out well because the sand didn’t hold to this grid of sections. I therefore shaped the sand through pushing and shaking the sand underneath the paper model, this method was not precise, but it seemed to hold the shape of the model well enough. I used a very coarse aggregate to fill the model, to make sure that the concrete slurry would filter all the way to the bottom. The size of the aggregate was roughly 10mm. For the slurry I used 0,75 part of water for 1 part of cement, in total 7 kg of cement. I think that the paper was to thin for the size of the model. It was to difficult to shape an area of 50*70 cm of sand underneath a model. The edges of the model was to thin, so it bended, also because the aggregate was so large that it didn’t shape the model from the inside. For the recipe for the slurry I think that I could have used less water since the aggregate was larger than in the previous assignment. My initial idea is to try to use concrete to copy this paper folding structure showing above. As a result I may get a shell-like concrete structure which is generated from the shape of the paper. I choose the fabric form work to achieve this. 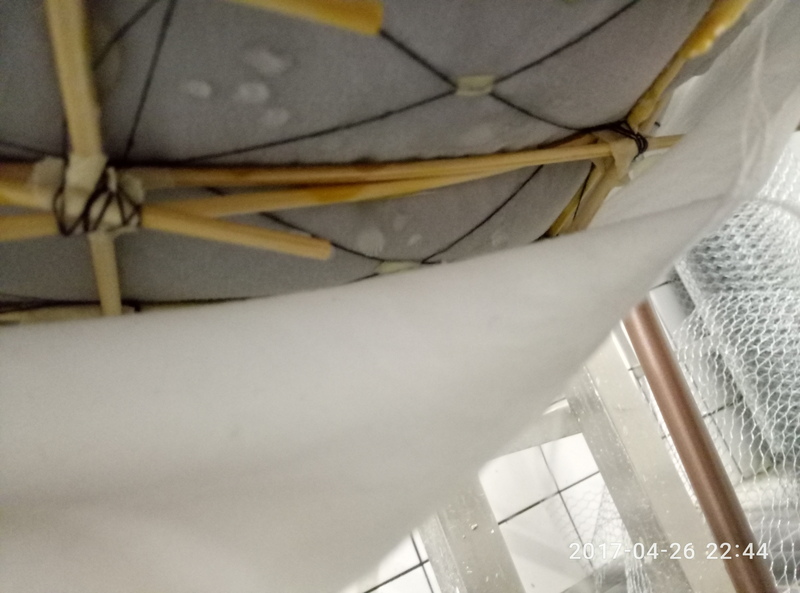 Using the sticks and strings to imitate the folding edges of the paper, and then cover it with the fabric to get the mold. The recipe of the concrete is 1 cement, 0.5 water and 0.5 sand. The mixture is almost liquid like, which makes it easier to pour it evenly onto the fabric. Due to the weight of the concrete, the wooden sticks bent to a curve. At first I used 1kg of the mixture. But then I doubled it to make the structure bend over even more, As a result I got an approximately semi circle, which is a more reasonable shape for a shell structure. Made a mistake when I went to check it about 24 hours later. I somehow moved it and the wooden sticks suddenly rebounded and teared my cast apart. But I managed to glue them together. This is the final view of the cast. As the cast is the opposite to the mold. It is actually not a very strong structure. The position that is supposed to be beams are actually weak while the position of ceilings are too heavy. I think if I use the concrete as the mold and cast again then I can get a reasonable structure. The aim was to recreate a plastic bag with concrete casting. Important factors or characteristics of the plastic bag that I wanted to recreate was its lightness (weight), its creases, its smooth (often) glossy surface and of course the function as a container. The base of this research, or experiment, derives from the assignment made in the “adaptive formwork” by the concrete guru’s; Daniel Ellis Karlsson, Jakob Lif and myself, but is here a bit more explored. The method requires: 3(!) plastic bags, sand and concrete. The first (inner) bag is the create the void, therefore it is filled with sand to hold the pressure. It also gives the casts inside its texture. The second (middle) bag is to contain the concrete mix and give the outer texture. The third (outer) bag is to “suspend gravity” by giving support to the cast, it is also filled with sand. This is the least necessary bag, but without it the middle bag would want to expand to its fullest, making the cast balloon-like. The concrete should be able to recreate the texture of the plastic bag and fill all hollows while still retaining its stability. I used a quite standardized and common plastic bag in the series of casting: the Toppits 2 l freezer bag. According to the producer it’s very durable, easy to fill because of the flat bottom and wide opening, and also hygienic. This together with the thin plastic made it the perfect choice. It gives a very cheap look to the cast, because the plastic lacks rigidness it creases a lot against the supporting sand. A thicker, more rigid, plastic would give a classier look. I also tried with adding some pigment to distance the final product from the concrete feeling and bring it further to the plastic aesthetic. After trying to recreate that cast I found that that method gave a very thick and heavy cast, probably due to the amount and size of the aggregate required. To overcome this problem I instead tried to cast without aggregate. The obvious solution! This required a change in technique. The concrete could no longer be added in the end by pouring from the top, but had to be built in the mold. I built up the cast layer by layer, with sand and cement. The result was more in the spirit of a plastic bag than the first try, but the lack of aggregate and the very fluid concrete mix led to that much of the mix built up in the bottom and the walls only became (too) thin shells at best. This could either be fixed by a more solid mix or/and by adding some aggregate that would give the construction necessary thickness. So the third try was with a more sturdy mix, that wouldn’t completely give into gravity and settle in the bottom. This was the most successful attempt. Recreating the lightness, but still having some stability, evenly spread thickness, full of wonderful plastic bag creases! 1 % red pigment for the gravel cast and 0,5 % for the gravel. To further experiment on this method I made two more casts; one with sand as aggregate and on with gravel. I also let the supporting material of the two casts be the reverse from the aggregate. So the mix with the sand as aggregate had gravel as supporting material. The gravel mix didn’t blend well, leaving pieces of rocks in a cement slurry, which gave to cast a very varying thickness of goods. Breaking in some parts, being too thick in some. This I think could be helped by lowering the water content. The sand mix came out well, the only whole cast. The walls are a bit too thick to go as a plastic bag, but this could easily be helped by adding less of the concrete mix into the cast. Even though there still is to explore: were the breaking point between “thin and broken” and “thin enough and whole” is. We set out to make an organic free form shape cast only in different sizes of aggregate. The result of the first test of aggregate and slurry mix. The straws helped the cement mix to go down in the aggregate and the slurry mix seamed to work so we went up in size for the final cast. We used three different sizes of aggregate, very small which we sieved, middle size and quite large pieces for where we wanted the cement mix to go down. We poured the cement mix in steps to make sure that it would go down in the aggregate, and built the shape in many layers. 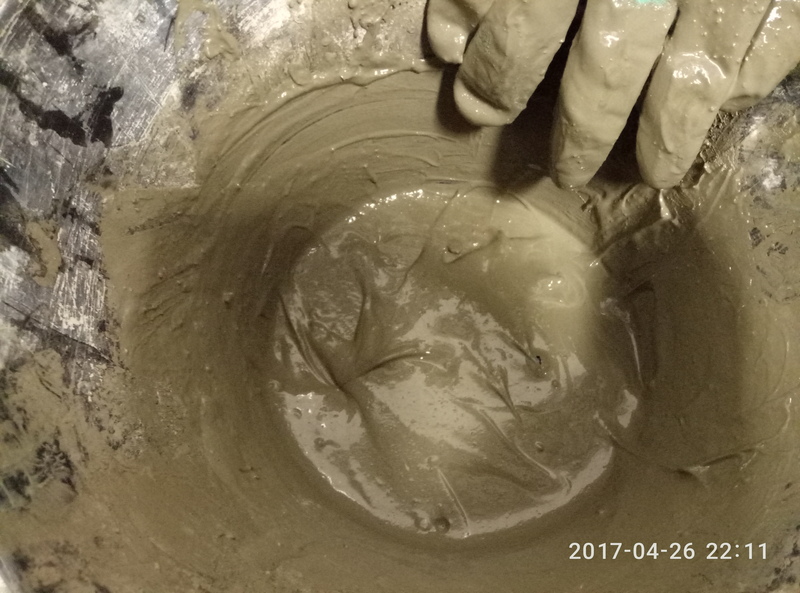 A piece fell of in the process of removing the cast from the bucket, we could have reinforced the shape with for example steel wire, or greased the bucket before we cast. Otherwise the shape we got was what we set out do make. The different aggregate made it possible to make voids and the shape was quite easily controlled. The method of casting in only different aggregate is good since there is not much waste material, and you don’t need that much cement since it is such a large portion of aggregate.